All stops locations and times combined to a single day. Explore in full screen. In their follow-up study, researchers at Central Connecticut State University Center for Municipal and Regional Policy sought the exact spots where drivers were pulled over. It wasn't an easy effort. Though some departments in cities like Stratford and Hamden made all their information available, many departments could not, so researchers extracted data from addresses and other details from thousands of stops. They focused on getting the location information from nine municipal departments and two state police troops that were identified as exhibiting statistical evidence for racial disparities in traffic stops. Researchers had mixed success in finding the latitude and longitude of stops in some towns — especially in Granby and Wethersfield, where they could only geolocate 40 and 28 percent of the stops respectively. This level of detail is unprecedented in the gathering of traffic stop data. Previously, crime and emergency location and time data have been used by law enforcement officials to help inform where to allocate resources. But now, this detailed traffic-stop data at the department and officer level can help determine where patrol officers might be focusing too much or not enough, as well as flag potential activities that have strong indicators for racial profiling. This analysis is based on data from 2013 and 2014 and not the newly released data for 2014 to 2015. In 2013 and 2014, East Hartford exceeded the threshold benchmarks established by researchers as indicating racial profiling. Only 79 percent of all stops were successfully geolocated. 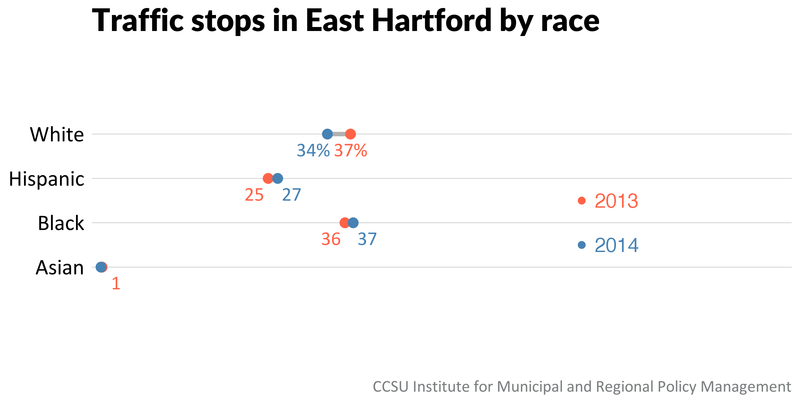 More than a quarter of traffic stops in East Hartford occurred in a specific neighborhood that includes Route 2 and Interstate 84 and the commercial areas near the highway access ramps. East Hartford has higher levels of traffic enforcement concentrated in areas that have the largest minority populations. Minorities make up more than half of East Hartford's driving-age population at 51 percent but make up 72 percent of all residents stopped by police. 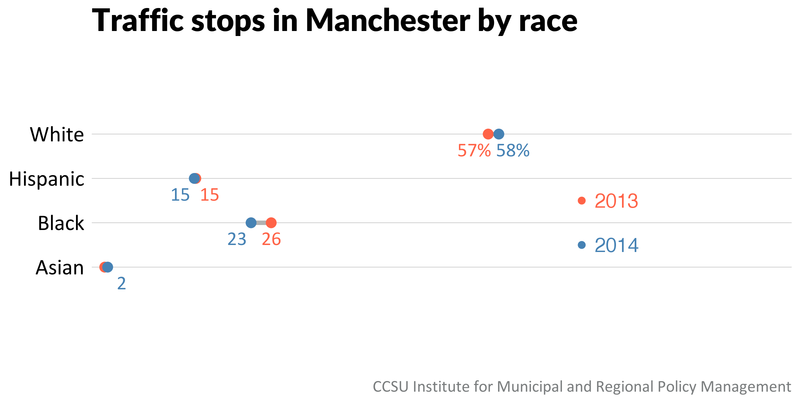 There is a noticeable disparity between population and stops among minority drivers in the northeastern-most tracts that border Manchester. Checks for registration make up a significant portion of traffic stops, particularly among black and Hispanic drivers in East Hartford. One officer was responsible for 78 percent of all registration stops, according to researchers. Vehicles driven by black drivers are twice as likely as those driven by whites to be searched in East Hartford, even though white drivers were discovered with contraband at a higher rate. The overall rate of stops involving searches is very small, around 3% of all stops. Researchers found that traffic enforcement locations correlated with heavily travelled roads, where traffic accidents occur more often. Police also said other factors that influence where they patrol are crime rates, service calls, and accidents. There are 80 police officers in East Hartford and just two were responsible for nearly half of all traffic stops between 2013 and 2014. Ten officers accounted for 84 percent of the stops. Traffic stops can be heavily influenced by a handful of officers. Only about 40 percent of traffic stops by Granby's police department could be mapped, so researchers focused on major roadways. The town of Granby borders Massachusetts and is surrounded by towns that are predominantly white. Granby also has a population that is 96 percent white. More than 1,200 traffic stops were conducted by 16 police officers in Granby in 2013 and 2014. One officer conducted more than a quarter of all of those stops. 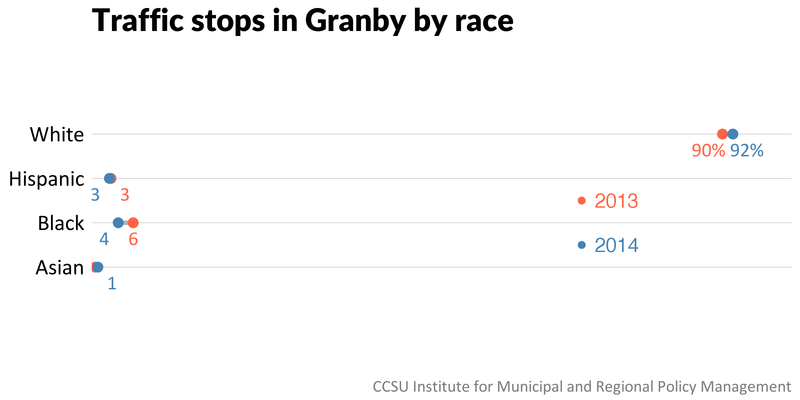 Minorities were stopped in Granby about 9 percent of the time, which is three times their share of population. However, only 36 percent of drivers stopped in Granby were residents. The rest were driving through. Granby, which borders Massachusetts, has one of the highest rates for stopping out-of-state drivers in Connecticut. Many drivers pass through Granby on Route 20 on their way to Bradley International Airport. Only a handful of drivers were stopped and searched in Granby. While looking deeper into stops in Granby, researchers discovered that many stop records were repeated. Accounting for that, they redid their analysis and discovered that Granby's contribution to the overall statewide disparity was overstated. 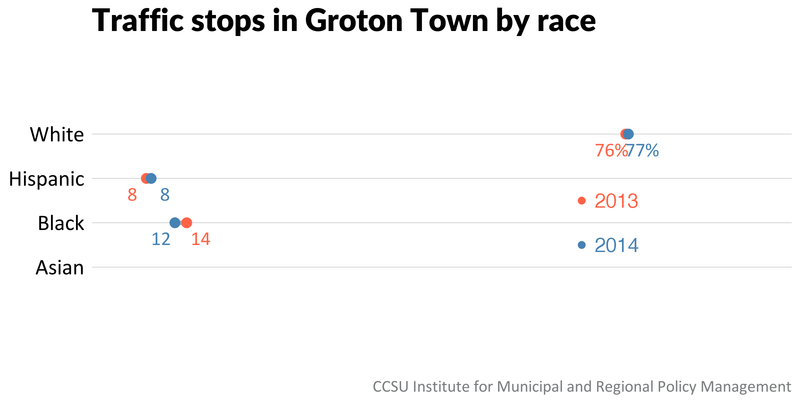 About 6,500 traffic stops were made in Groton Town— 24 percent of which were minorities. Almost 80 percent of stops were successfully geolocated. The towns that border Groton include Ledyard, Stonington, New London, and Waterford. Each have predominantly white populations. The town also is home to the New London Naval Submarine Base, which officials said might throw off calculations. Many of the census tracts with high proportions of minority drivers stopped reflect the high population of minorities, but there are some areas where the stops exceeded the population. One of the most-enforced areas in Groton Town borders a tract in Groton City that has the highest proportion of minorities in the area. Several areas also showed evidence of disparity between Hispanic drivers stopped and population. Like other towns, the police department in Groton Town was twice as likely to search vehicles of black drivers compared to white drivers, though contraband was discovered at a higher rate among white drivers. Groton Town has almost 70 police officers but fewer than a dozen accounted for more than half of the traffic stops, which greatly influences the department's overall statistics. For stops in 2013 and 2014, Groton Town was identified by researchers for exceeding standards based on the Veil of Darkness methodology, but in the most recent report for 2014 and 2015, it did not. 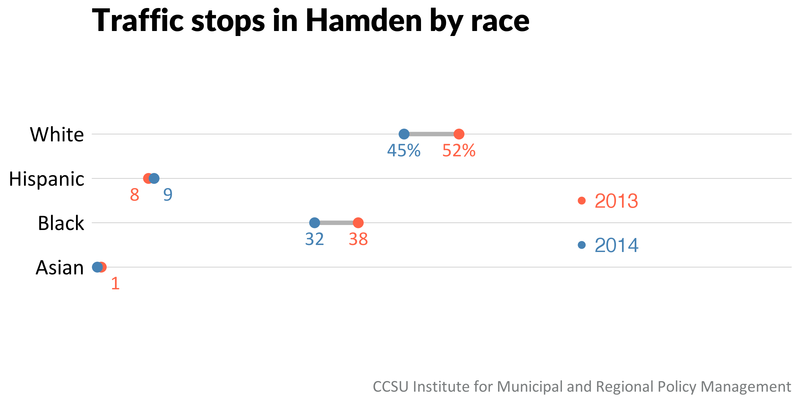 More than half of the stops in Hamden involved minorities, though the town's driving population is 31 percent minority. More than half of the traffic enforcement activity is clustered in three tracts that border New Haven. Only a quarter of Hamden's population lives in that area. The tract closest to New Haven had the biggest disparity between the proportion of stops involving minority drivers and the minority proportion of the population. There were 127 drivers stopped over the Hamden town border between 2013 and 2014. Of those, 65 percent were black. Officials said this sometimes occurs when a violation is spotted in Hamden but the driver pulls over in another town. On average, drivers in Hamden were pulled over for violations involving vehicle lighting, improper display of license plates, and window tinting 21 percent of the time. However, in the three census tracts bordering New Haven, black drivers were pulled over 58 percent of the time for violations involving lighting, improper display of license plates, and window tinting compared to white drivers at 35 percent. Outside of those three tracts, those figures were reversed. The Manchester Police Department made 3,400 traffic stops between 2013 and 2014. Of those, 43 percent were minority drivers, though minorities compose about 28 percent of the driving age population. In 13 out of 14 tracts that make up Manchester, minorities were pulled over at a rate that exceeded their population. The areas that got the most traffic enforcement attention have high traffic volume, population density, and crime rates. They also include the town's retail district and an exit from Interstate 84. Contraband was discovered at a higher rate among Hispanic drivers at 63 percent, though black drivers were pulled over at a higher rate. The contraband discovery rate in Manchester among minorities exceeds the state average, which might justify the search rate, unlike in other towns. Traffic officers in New Britain pulled over drivers 5,500 times in 2013 and 2014, of which 63 percent were minorities. Minorities who are of driving age make up about 44 percent of the town population. Researchers only managed to geolocate 76 percent of the stops. One area saw a disparity between minority population and stops as high as 25 percent points. Police said traffic enforcement resources respond to areas where there are most traffic safety complaints from community members. About 72 percent of those stopped were residents of New Britain, which exceeded the state average. More than 100 officers conducted stops in New Britain with six officers generating about 25 percent of them. White drivers were more likely to be pulled over for unsafe driving violations like speeding or not stopping for a stop sign. Meanwhile, black and Hispanic drivers were more likely to be pulled over for equipment violations like vehicle lighting or window tinting. New Britain had high stop rates among Hispanic drivers, particularly in a handful of neighborhoods that far exceeded the population. Researchers said that disparities do not necessarily mean bias. Reasons for disparities in one area could be different from those in another. 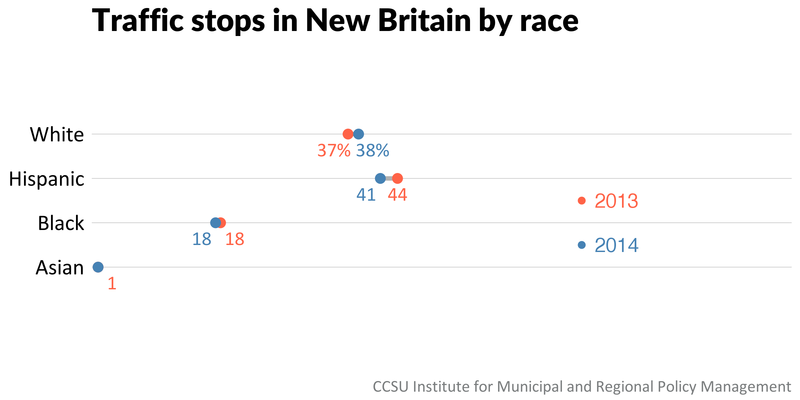 Black drivers in New Britain were stopped most often out of all stops (6 percent of the time) though they had the lowest rate of contraband compared to white and hispanic drivers who were also searched. 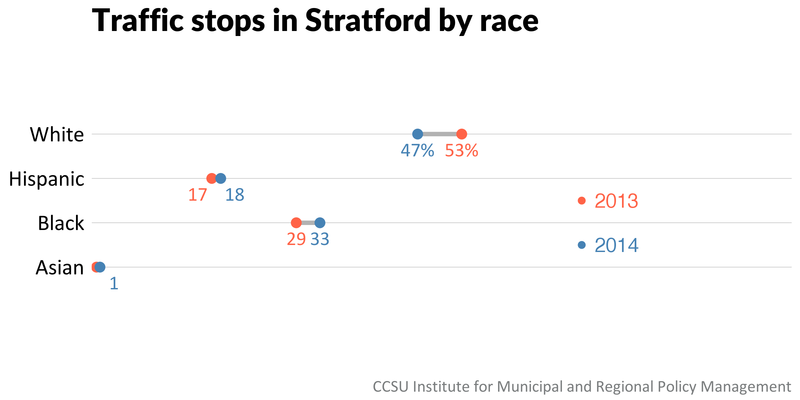 Stratford's minority population who are of driving age is 26 percent though they made up 47 percent of traffic stops. Police made about 3,000 stops total between 2013 and 2014. The city shares borders with towns that are predominantly white, except for Bridgeport. The largest share of traffic stops, about 42 percent, happen in tracts closest to a tract in Bridgeport that's about 97 percent minority. A small portion of Stratford's 77-officer force have a big influence over the city's traffic stop data. Nine of them account for 45 percent of all stops. The three tracts that generated the most traffic stops also are the three tracts with the highest population of blacks and Hispanics. Also, about 60 percent of drivers stopped in Stratford were not residents. More than 20 drivers were stopped outside of Stratford's borders. Officers in Stratford conduct searches at about twice the state average. 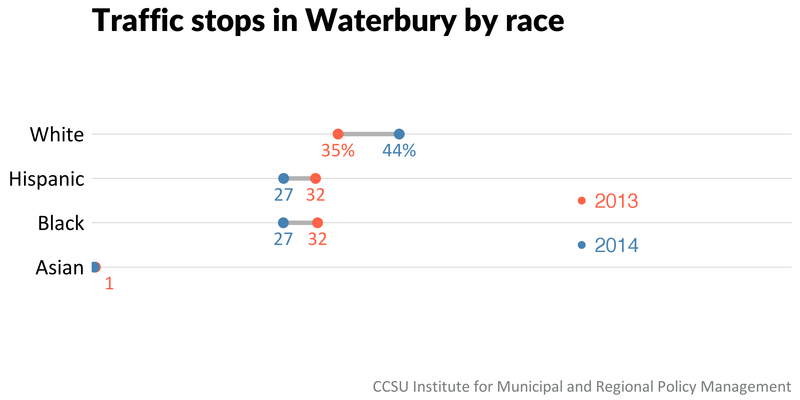 Less than half of the Waterbury population is a minority, but almost two-thirds of drivers stopped were minority. Researchers said the department has shown evidence of pulling over minorities more often during day light hours when race can be identified compared to white drivers compared to those stopped at night. The majority of traffic enforcement in Waterbury is centered in the middle of town. Police said traffic enforcement activity is focused on areas with high levels of violent crime. Researchers said there is some correlation between traffic stops and crime in some tracts but not for areas south of I-84 and downtown where there is low crime. Waterbury does not have a Traffic Division, but 153 officers reported pulling over a total of 1,742 drivers. Little more than 20 officers were responsible for 60 percent of those stops in Waterbury. Six officers accounted for a third of all stops in Waterbury. The rate for searches in Waterbury is 10 times the state average. The vehicle of nearly one in three drivers pulled over in Waterbury is searched. The police department is also aggressive with vehicle towing. Out of the 1,700 or so vehicles stopped, about 500, or a third of them, were towed.